Finding a great professional knife sharpener is a difficult task. While the traditional knife sharpening methods include either a manual hand-held or electric knife sharpener, there are also other sharpening methods that can be better for your needs. One such option is a whetstone sharpener, which is a block made of certain material that works to sharpen knives when it is soaked. Below you will find a review for the Sun 300/1000 Combination Whetstone. The product is manufactured by Shun Company. Shun Company is one of the most popular Japanese whetstone suppliers, borne out of the Samurai tradition of knife sharpening. Their products are built for all knives, including ones that are of professional and high-quality. Their whetstone products are built to provide your knives with a precise, flawless, and smooth finish. Whetstone greatly differs from other knife sharpening methods. 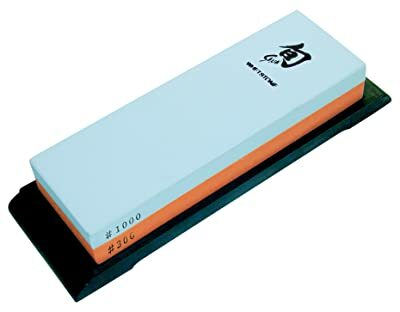 This particular product is a dual sided whetstone, with one side at a 300 grit level and the other side at a 1000 grit level. Grit levels are essentially the level of grain that the whetstone features, and each level can be used for a different knife sharpening purpose. A 300 grit level is used for knife that are especially dull. When using this level, you’ll be able to quickly sharpen your knife and also fix chips on the knifes edges. In terms of the 1000 grit level, this level is used for regular sharpening and can be used for any knife. The process of sharpening using this stone is a bit different than other methods. For optimal sharpening and to preserve the quality of your sharpening block, you need to soak it for 15 minutes before use. This will help lubricate during the sharpening process and maintain the life of the product. It is perfect for professionals or those used to sharpening knives with a whetstone, and it is produced by a quality company that has a wonderful reputation for its quality products. Those that purchase this product may notice that it takes time to get used to using this product and some effort is needed, but overall, it is well worth it, as all your knives will be extremely sharp and ready for use.